The No. 98 Ford Mustang for Stewart-Haas Racing with Biagi-DenBeste (SHR) makes its seventh appearance of 2018. Chase Briscoe has three starts in the No. 98, Harvick two and Aric Almirola made one. 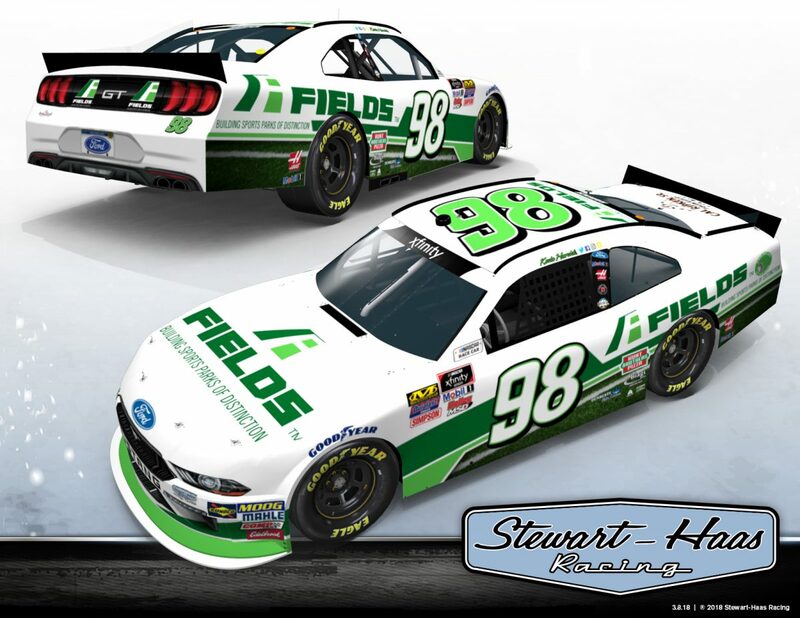 FIELDS makes its first appearance as the primary sponsor of the No. 98 Ford with driver Kevin Harvick in 2018. FIELDS appeared on Harvick’s No. 4 K&N Pro Series West Ford at Sonoma and the No. 41 Ford for Stewart-Haas Racing in the Xfinity Series at Watkins Glen in 2017. FIELDS has worked with The Kevin Harvick Foundation over the last few years to help create fields at the Boys & Girls Club in Vero Beach, Florida, Greensboro, North Carolina and in Harvick’s hometown of Bakersfield, California. FIELDS is currently working with the Kevin Harvick Foundation on a new project in Charlotte, North Carolina. In their first race of the season, Harvick and the No. 98 team scored the win at Atlanta Motor Speedway on Feb. 24, 2018. Harvick started fifth, won both stages, led a race-high 141 of 163 total laps and beat runner-up Joey Logano by 4.183 seconds. Harvick is making his third of five scheduled Xfinity Series starts in the No. 98 Ford Mustang for SHR in 2018. Harvick has one Xfinity Series win at Michigan (August 2003), four top-five finishes and eight top-10s in his 10 Xfinity Series starts at Michigan. This weekend marks Harvick’s first Xfinity Series start at Michigan International Speedway since June 2015, when he started seventh and finished sixth. In 343 career Xfinity Series starts, Harvick has 47 wins, 184 top-five finishes, 257 top-10s, 25 poles and 9,639 laps led. The team’s spotter, Tim Fedewa, claims Holt, Michigan as his hometown. Holt is approximately 55-miles north of Michigan International Speedway. Harvick will be joined in the Michigan field by SHR teammate Cole Custer in the No. 00 Haas Automation Ford Mustang.